The original version of this article, by Deirdre LaPin, appeared on the Niger Delta Working Group and AllAfrica. Shell Petroleum Development Company (SPDC) suspended active production in Ogoniland in late 1993 as a response to growing resistance to industry presence led by the martyred freedom fighter and writer Ken Saro-Wiwa. However, the company remained responsible during its withdrawal for monitoring and maintaining its installations, and especially the critical Trans-Niger pipeline serving Bonny Terminal. It also left behind a number of spill sites. Over the years the company had mixed success in negotiating with local communities access to spills sites or achieving their complete remediation. The impoverished local population also pursued informal oil production that centered on bunkering (oil pipeline tapping) and bush refining – increasing opportunities for further spills and pollution. In keeping with the “polluter pays” principle, the operator SPDC joint venture funded the U.S. $9.5 million UNEP study. Last week the press had a field day with the freshly unveiled report. Now in 2011, UNEP’s thoughtful recommendations, while not assigning blame, point clearly to the need for a genuine shift in the priorities and practices of the oil industry and governmental regulatory agencies operating throughout the Niger Delta. The muscular sub-text rippling throughout the report makes clear that nothing less than ending pollution and full remediation of Ogoniland (and indeed the whole Niger Delta region) should be accepted as an end point. Continue reading on the Niger Delta Working Group. For more on the Niger Delta, be sure to also read “Nigeria’s Future Clouded by Oil, Climate Change, and Scarcity,” which includes the full audio interview with Deidre LaPin (excerpted above) on the history of the Niger Delta. 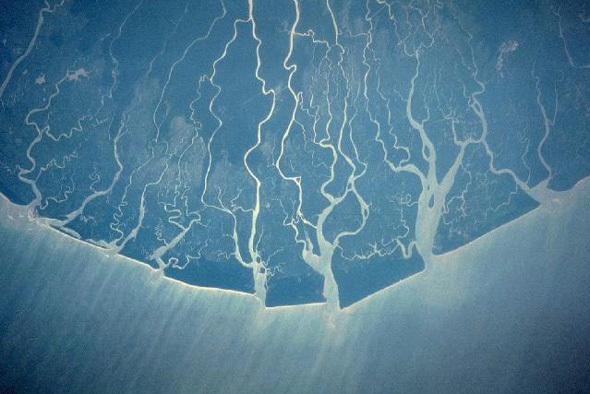 Photo Credit: NASA Space Shuttle Overflight photo of the Niger Delta, courtesy of NASA. Very interesting history here with all the challenges posed by working with governments, IOs, private sector, local communities, local NGOs, and not to be forgotten, the media. Sounds like the assessment is a significant advance in understanding. The politics of course are every present. But glad UNEP stuck with it despite the challenges. Hope it spurs action and improvements in the natural and human environments in the delta. I find it very interesting but I can't play the video. Anyway, the muscular sub-text rippling throughout the report makes it more clear.